There are a few ‘can’t live without’ products and I think you'll agree when I say, a Pack N Play nearly tops that list. The security of knowing your baby is safe in the Pack N Play while you get things done makes life so much easier. But with so many options and features, how do you choose the best Pack N Play? After searching high and low we've narrowed a list of the best Playards 2019, and one thing is for sure, choosing the best play yard isn't exactly child's play. Whether you’re looking for the best pack n plays for sleeping, something lightweight for travel, or the best playard with bassinet; we’ve put together the ultimate list of best Pack 'N Plays 2019. Sounds awesome, doesn’t it? Well, let's get to our picks! So, just which is right for you? Our team has tested this year's models and weighed out the contenders, and came up with a definitive list of best Pack and Plays 2019. There are more Pack and Plays on the market than ever before, today we'll be breaking down the good and the bad of our top picks so you'll feel more confident with whichever playard you plan on buying. To help you find the perfect Pack and Play, here are our picks for the best Pack N Plays 2019. The Good: The Graco Pack 'n Play On the Go Playard is cleverly designed with automatically folding feet, comfortable removable cot and the beautifully designed toybar. Not only is it the best selling Playard on Amazon but it's out pick for best overall pack n play 2019. The Bad: You should probably know the Graco On the Go Playard is on the heavier end of the Pack N Play spectrum so keep in mind if you're looking for a pack n play that's lightweight and best for travel you might want to pass on this one. The Summary: This Pack N Play offers an effective and (more importantly) really comfortable solution for parents who need to keep their baby happy wherever they go. The On The Go Pack and Play instantly unfolds and also has an attractive price tag, with how versatile this pack n play is and the price point we've ranked it the best overall pack n play on the market. What We Love: We love the inclusion of the toy bar, while the carefully thought out design makes this Pack N Play easy to use and relatively compact. 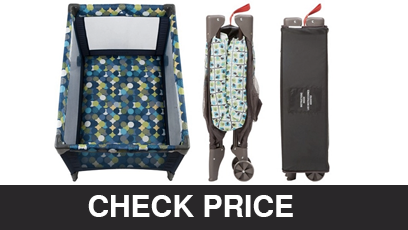 The Bottom Line: The best Graco Pack N Play for travel. If you aren't keen to spend a huge amount and need something that'll get the job done for years, this Graco pack n play will be ideal for you. The Good: The Disney Wonder Play Yard benefits from the personality of Mickey and friends, and is a solid Pack N Play, with a handy diaper changer, breathable bassinet, and plenty of space. The Bad: Not the simplest option, and learning how to set it up properly can take some time. The package includes a few smaller accessories, so keeping the parts together can be a chore. The Summary: This wheeled Disney-themed portable nursery has a comfortable bassinet and breathable mesh around the cot. Soft Disney toys are included, along with an diaper changer and organizer to store essentials. What We Love: Aside from the Disney tie-in, we loved the thoroughness of the Sweet Wonder's design, which makes it portable enough for travel use, but full of storage and play space. The Bottom Line: This Sweet Wonder pack and play will obviously appeal to Disney fans, as well as parents with lots of accessories to keep safe, if you love Disney, this is the pack n play for you in 2019. The Good: The Lotus Everywhere Travel Crib contains no flame retardants, has an elegantly simple design, with a large zippered play space, and is very lightweight. The Bad: While the design is nice and simple, putting this portable crib up can take 5-10 minutes, and it can be tricky to stuff in the Lotus travel bag as well. The Summary: This Pack N Play from Lotus has a traditional design, offering a single space for babies to play which is easily accessible via a diagonal zipper. It weighs just 13.9 lbs and folds up to impressively small proportions. What We Love: We loved its ecological credentials and its extremely light feel. With practice, it can also be a very convenient option. 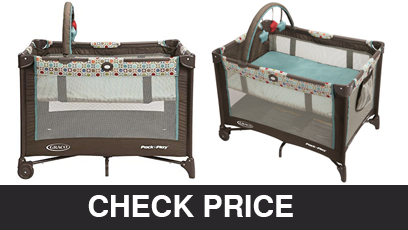 If you're in the market for a lightweight playard, this is the pack n play you should consider. The Bottom Line: The Lotus is a top rated Pack N Play for people with environmental concerns, and ideal for long distance travel - as long as you get to grips with the set up. The Good: The Joovy Room2 offers an impressive amount of space and is extremely mobile thanks to its castors. Carrying it around is also a joy, thanks to the Joovy shoulder bag. The Bad: There aren't any extra storage features and it can be difficult to assemble without damaging the plastic struts. It's also a little on the large side. The Summary: The Joovy 2 is a square play yard with mesh walls and a lightweight construction, the Room 2 offers 10 square feet of space and can be wheeled to wherever makes the most sense. What We Love: We loved the mobility of the Room 2 Playard, which made it great for outdoor use, and had to admit that the extra space can be great for active babies. 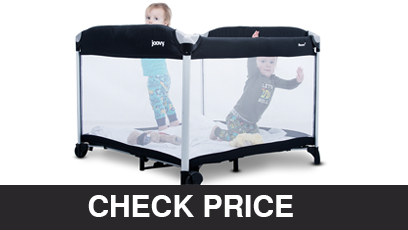 The Bottom Line: If you want to play outside with your newborn, the Joovy Room2 is a great option, and it is perfect for larger, more active children. The Good: The BABYBJORN Travel Cot can be put up in seconds, has a clever angled design which maxes out on play space, and is generally very well put together. 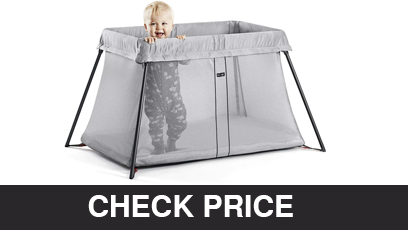 The Bad: The BABYBJÖRN travel cot play yard doesn't come cheap, and it also doesn't feature a detachable bassinet, so may not suit younger children. 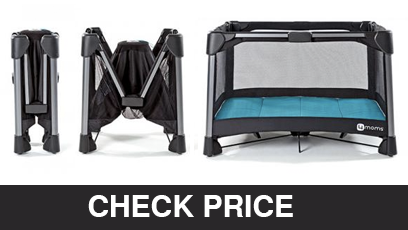 The Summary: This 11lbs travel cot pops out in seconds to provide a safe play space. It has angled sides which make great use of space, breathable mesh walls and comes with a comfortable padded mattress (but no bassinet). What We Love: This lightweight BABYBJÖRN cot is incredibly convenient for setting up quickly, and we also appreciated its easily washable, durable materials. Overall it's a very quality lightweight pack n play. The Bottom Line: The BABYBJORN Pack and Play is a versatile cot for kids up to 3 years of age, this one of the very best Pack N Plays for travel we've seen. The Good: Like a tiny apartment, the Snuggle Suite pack n play features living space, a sleeping cot and storage compartments, as well as a bouncer to keep little ones happy. The Bad: Because of its complex design, the Graco Snuggle Suite Playard can be a little tricky to put together and is relatively bulky. The Summary: The GracoSnuggle Suite comes with a diaper changer, bouncer, cot and play space all in one. It also features built-in sounds to soothe babies and a look-light for use during the night, it really is an all in one package when compared to most pack and plays we reviewed. What We Love: This Graco Portable Crib comes with a bouncer, changing station and play space, it delivers plenty of features for moms and dads to use. The Bottom Line: If you want a Pack and Play that can do everything, the Snuggle Suite could be ideal play yard for you. It's easily one of the best Graco playards to consider in 2019. The Good: The Cosco Funsport Play Yard is a great lightweight Pack and Play that is extremely easy to open, very mobile, and packs up neatly in a handy compact travel bag. The Bad: The Funsport isn't full of creative features and doesn't come with vast storage space. You may need to add a mattress to counter the relatively hard base. The Summary: The Funsport pack n play offers 40 x 30-inches of room and weighs in at 19lbs. It's easy to erect and put away, and very easy on the wallet as well. What We Love: The best thing about this play yard is its simplicity and price. There's no frills here - just a solid child-friendly product at a fair price. The Bottom Line: Parents who want to economize but still provide a safe, fun space for kids to play will love the Cosco Funsport Pack N Play. The Good: This playard comes with a stable design, excellent mobility, a mobile to entertain occupants, and a bassinet, changing station and storage space. The Bad: The BabySuite Deluxe Pack and Play can be a little laborious to put together, while the mattress pad could definitely be more comfy. The Summary: An all-round play yard with bassinet, play space and storage compartments, the BabySuite Deluxe weighs 22.75lbs and offers plenty of room. What We Love: This playard is great for wheeling around the home without worrying about stability, and its generally a solidly put together product. 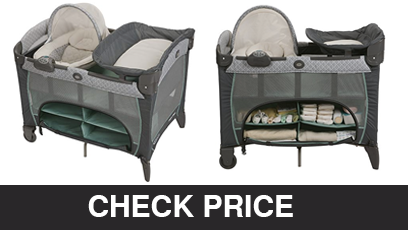 The Bottom Line: Probably the best baby pack and play with bassinet included. A wonderfully versatile, attractive and mobile play yard. The Good: The Delta Children Playard is easily the most colorful playard we've reviewed, the Delta Pack and Play offers a cute playspace and lots of room. The Bad: It's a little bit on the heavy side, and can be difficult to set up quickly, so isn't ideal for travelers. The Summary: The Delta 36 x 36-inch beautifully designed playard has a quirky multicolored look and animal prints on the mesh walls. It weighs 28lbs and comes with a carry bag and mattress. What We Love: The color and vibrancy of this playard is wonderful, and it's a pretty well-made product all-round with a lot of space and a nice price tag. The Bottom Line: If you want to stimulate your child with appealing visuals and need somewhere safe for them to play, this could be the best play yard to choose. The Good: The Chicco Lullaby Dream playpen is spacious, the mattress is luxuriously quilted, everything is machine washable, while the toy bar also provides entertainment for young occupants. The Bad: This Chicco pack n play is bulky, so not the most ideal pack and play for travel due to it's size. The Summary: The Chicco Lullaby Dream baby playard is a high-end pack and play that has everything - toys, a quilted mattress, a detachable "newborn napper" and a changing pad. What We Love: The Lullaby Dream Pack N Play will last for years. It has features for newborns and toddlers alike, and is beautifully engineered. 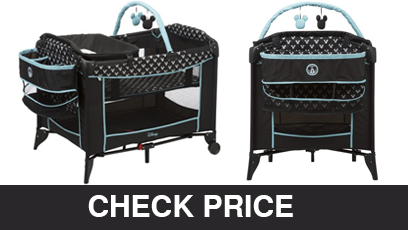 The Bottom Line: This Chicco Pack and Play is ideal for parents who want a solution for infants and toddlers who prefer comfort and versatility in a pack and play. The Good: The Graco Playard with Newborn Napperstation Pack and Play is useful for infants and toddlers alike and comes with a comfy cot made with soft velour fabric which will be easy on infants' skin. The Bad: This Graco Pack 'N Play Playard has an angled bassinet that has raised some safety concerns you'll want to consider looking into. The Summary: The Graco Playard with Newborn Napperstation is designed to allow for a smooth transition from baby to toddler and features a playspace and pad, as well as a comfortable Napperstation that really makes it a standout pack and play when compared to others. What We Love: The napper and changing station make a convenient combo for tending to newborns, while as babies develop the rest of the package comes into play. 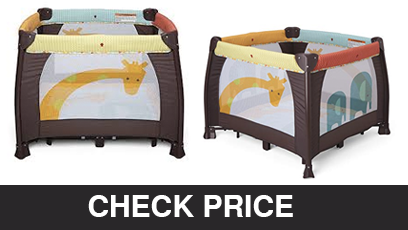 The Bottom Line: Easily the best Pack and Play for sleeping, both for infants and toddlers. The Good: The 4Moms Breeze Playard is nice and simple, easy to set up, and comfortable to use. The Bad: While the Breeze Pack n Play is intended for travel, it's actually somewhat heavy and bulky. The Summary: The 4Moms Breeze Pack ad Play is a classic baby playard which weighs 23.9lbs, comes with a polyurethane foam mattress, and has a detachable bassinet and a carry case. What We Love: Putting up the Breeze Playard is, well, a breeze, and the construction should last for ages. There's no shortage of room for toddlers to play as well. The Bottom Line: The 4Moms Breeze Pack N Play is ideal for parents who want a long-term investment, and a relatively hassle-free setup. The Good: The Fisher Price UltraLite Pack and Play is a great small pack and play. Very attractively priced, quite lightweight, and very easy to use. The Bad: The UltaLite probably contains flame retardants and could be more comfortable overall when compared to other baby playards we reviewed. The Summary: This no-frills Pack N Play weighs just 17.3lbs and measures 38 x 26-inches. 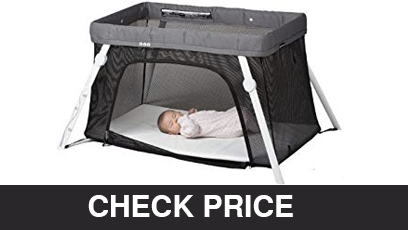 It includes a bassinet and play space (but very little else) and is easy to set up and take down. What We Love: What we love most about this Fisher Price pack and play is the right blend of essential functions, ease of use and a very appealing price tag. The Bottom Line: If you want a perfectly functional, safe play space but a bargain price tag, the Fisher Price UltraLite playard could well be the right Pack N Play for you. The Good: The EvenFlo Arena Baby Playard issuperbly versatile, and includes a bassinet, battery-operated napper and play space. The Bad: With the Arena pack and play, keeping all of the elements together can be a pain. The Summary: This 4-in-1 Pack N Play comes with features for the youngest new borns, older infants and toddlers. Features calming sounds, an automated rocker, changing table, and stable plastic legs. What We Love: The sheer adaptability of the EvenFlo Arena Pack N Play is breathtaking. And the quality and how it's made is exceptional as well. The Bottom Line: If you are planning ahead and want a versatile place for your baby to play, you may not be able to do better then the EvenFlo Arena Pack and Play. The Good: The Eddie Bauer Complete Care Baby Playard is great for babies and toddlers, plenty of soothing sounds and has excellent visibility thanks to the breathable mesh walls. The Bad: The Eddie Bauer Complete Care Crib could be more stable but doesn't take away from function. The Summary: The Complete Care Baby Pack and Play is extremely versatile and features a bassinet, changing station and a play yard. Weighs in at just over 35lbs (with the bassinet installed) and comes with vibrating function and 10 soothing noises. What We Love: The sounds make this Pack N Play a relaxing place for infants to rest, while the play yard is big enough for the most active toddlers. The Bottom Line: The blend of value, multiple functions and high quality make the Eddie Bauer Complete Care Baby play yard a great option for all parents. How Were These Pack and Plays Picked? When picking these Pack N Plays, we tried to keep a few things in mind. First off, we wanted a range of different sizes, to cater for travel and home use. And we also wanted to mix up very simple and complex options. Some of the options we've highlighted can be set up in a matter of seconds and packed away neatly for carrying around. But others take a little more practice to get right. 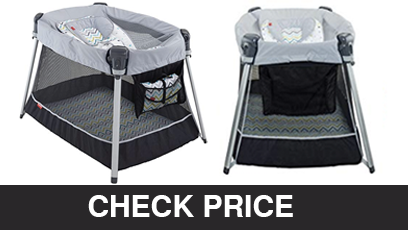 With Pack N Plays, you tend to find more features in complex models, and we wanted to offer a choice for parents between feature-rich designs and streamlined, no-frills options. Most importantly, we sought out Pack N Plays with a strong reputation and plenty of happy users. They might be fresh on the market, but all of these products have attracted positive Pack and Play reviews from parents just like you. Which Brands Make The Best Playards? There isn't one dominant brand in the world of Pack N Plays. Graco often attract more attention than the competition, and with good reason. They offer high-quality, affordable products with a wide range of choices. Along with Graco, affordable brands include Fisher Price, Cosco and EvenFlo, while 4Moms and Chicco are often a little bit more expensive. Disney's Pack N Plays are surprisingly affordable as well and shouldn't be overlooked. In terms of quality, customers generally get what they pay for. Chicco is a great premium brand, and Lotus is dependable as well. Both offer well-made, durable products which won't be too vulnerable to damage. 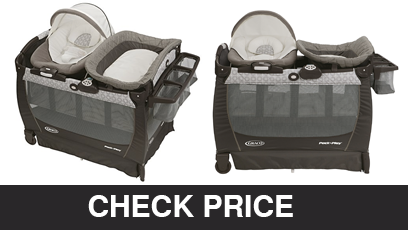 However, lower priced brands like Graco deliver impressive performance for a fraction of the price. 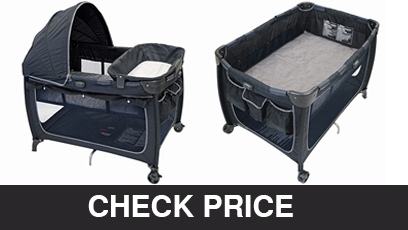 Before you choose your ideal Pack N Play, it might help to run through a few key buying factors. We've touched on these already, but here are a few things to keep in mind. If you want a changing station and bassinet, this will increase the weight, making your Pack N Play less suitable for travel, but better for home use. Think about visibility as well. 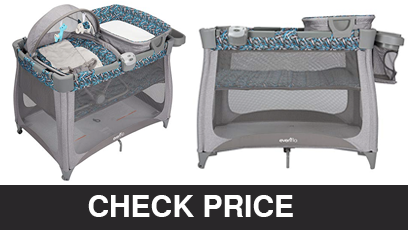 Ideally, your Pack and Play will have mesh walls which let you easily see how your baby is doing at all times. Generally speaking, parents tend to prefer Pack and Plays with a wheel and leg combination, balancing mobility and stability. If you need the best pack and play for travel, choose a light option with a handy carry bag - preferably one with shoulder straps. And check reviews to make sure it can be assembled easily. Finally, think about price. 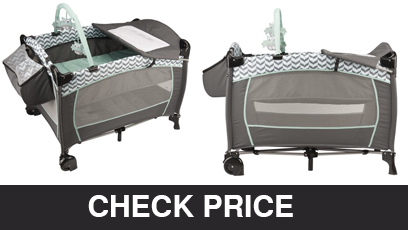 It isn't hard to find good Pack N Plays for under $100, but premium options definitely offer a little more durability. Make a choice based on what you are willing to pay. Pack and Plays are essential items for millions of parents, and its easy to see why. They provide comfortable, safe spaces for children to play, make changing diapers easy, soothe infants when they need to sleep, include storage space, and make traveling easier, too. All of our picks for the best Pack and Play 2019 will make parenting easier. But you'll need to choose the right product for your needs and budget. 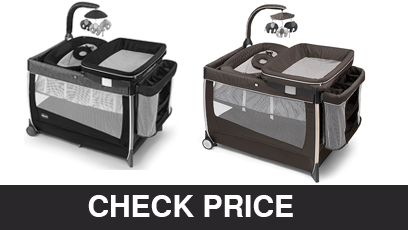 With so much choice available, it shouldn't be hard to find the ideal Pack N Play for you.